Mariners Sunday mailbag: August trade options? 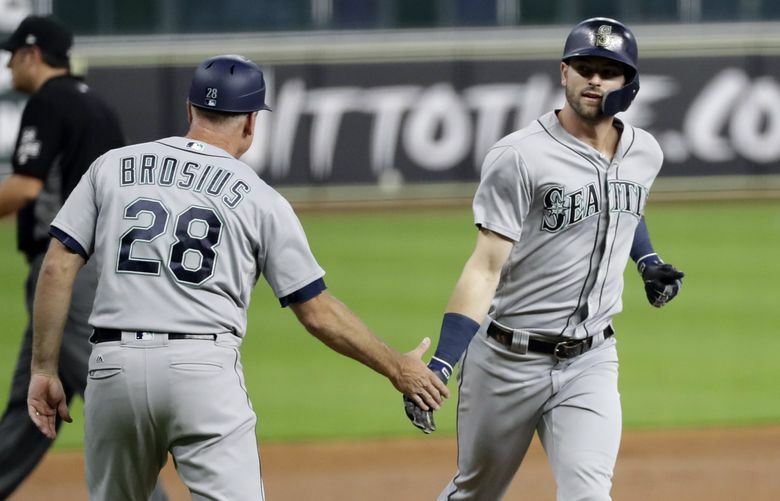 Is Mitch Haniger the new leadoff hitter? Mariners beat writer Ryan Divish once again makes the bold move to open his Twitter mentions. Inside: questions on Kyle Lewis, August trades, Felix Hernandez, Robinson Cano's return, robot umps and much more. HOUSTON — It’s been almost two months of the weekly Twitter mailbag and the questions keep pouring in when requested. What’s been beneficial is the variety of subjects. I try to mix it up and keep things light. If you take yourself too seriously, everyone tends to take you less seriously. My friends and I had this saying in college, “Don’t be ‘That Guy.’” It works in almost any situation in life. So in the effort to answer questions, I will try to keep it serious in some ways and humorous in others. But the quality of questions has helped that process and made it into one of the more enjoyable things I write during the week. As always, these are real questions from the eclectic mix of folks that made the mistake of following me on Twitter. As of now, that spots belongs to Erasmo Ramirez, who will start on Sunday in Hernandez’s place. It’s hard to say whether it’s permanent. He’ll certainly have to pitch better than Hernandez in the role and be better than he looked earlier in the season when he went 0-2 with a 10.24 ERA. The Mariners believe part of Ramirez’s struggles was not being completely right coming back from a lat strain during spring training. Ramirez’s lack of minor league options complicates the situation. Let’s say he was ineffective again, you could move him into the bullpen. But the pitcher he replaced is now the long reliever. Are you really going to have two long relievers? Or move Hernandez back to the rotation? No, the Mariners need Ramirez to be something better than Hernandez has been this season. They don’t need him to be dominant. They just need him capable of pitching six innings on most outings and keeping them in the game. It’s not a huge ask. But it was something Hernandez couldn’t do with any consistency. And if Ramirez can’t do that, the Mariners have some problems. Well, it won’t measure on the level of New Coke or The Godfather III or acquiring Erik Bedard. But it does seem like investing big dollars in middle reliever can be a bit like partaking in a 4 a.m. craps game at Caesar’s Palace with a bunch of guys wearing suits (not that I would know anything about that). So that’s $18.75 million they are spending on the trio. Getting 0.5 WAR back isn’t optimal. The Mariners got a total of 10 relief appearances from Phelps, who will be a free agent next season. Rzepczynski was bad from the beginning of the season. Nicasio has shown signs of effectiveness, but his troublesome knee inflammation that put him on the DL is an issue. He’s the only one under contract for next season. You could also look at it this way, the issues of those relievers also forced the Mariners to go out and get Alex Colome, Zach Duke and Adam Warren as well. Relievers were the trendy acquisitions this offseason. A bad starting pitching market was a factor in all of that. But the Mariners weren’t the only ones to get burned by it. Let’s look at the Rockies. Bryan Shaw: $7.5 million (-0.3 WAR). The logic of having a trio of lockdown guys at the end of games is solid. It’s the difficult of finding/acquiring them and getting results. With Cano back hitting in the three hole in a few days, where do you think Haniger will hit? Leadoff? 5th? There is no guarantee that Robinson Cano goes automatically back in the No. 3 spot upon his return. Though his dominance of 20-year-old pitchers in the Northwest League the past few games might make that difficult to do. But I do think Haniger will remain leadoff for a while. When you get seven hits in two games that tends to keep you in the same spot in the lineup. I think Servais likes having Haniger and Denard Span hit back-to-back because of their willingness work counts. Cano could slot in behind Nelson Cruz and bump Kyle Seager down in the order. The Mariners lineup will lengthen when Cano returns. But that ideal balance of alternating between right-handed and left-handed hitters might not be available for Servais. More likely to get a starting pitcher or a hitter through the waivers? I don’t see how they fit another hitter with their current 25-man roster. They already had to send Ben Gamel to Class AAA Tacoma and he was giving them some production at the plate. The roster will get even more complicated when Robinson Cano returns on Tuesday. Seattle probably won’t be able to carry eight relievers when Cano returns. They’ll need to keep Andrew Romine as a back-up infielder because he can play shortstop. I guess that would be the hitter you could acquire is to replace Romine as the back-up infielder, but that hitter would have to be competent at shortstop for them to make that move. With Sam Tuivailala done for the season because of an achilles injury, the Mariners could go grab another right-handed reliever for depth. That seventh inning spot is still a little bit shaky. And of course, everyone will clamor for them to get a starting pitcher to replace Ramirez, who replaced Felix Hernandez. Ryan with Jerry's history of August deals (Leake and Albers) who might be the kind of target is Jerry looking at? The one name that came to mind was right-hander Sonny Gray, who the Mariners tried to acquire from the A’s last season. Gray has been having an awful year with theYankees and was recently demoted to the bullpen. His fastball usage is way down despite the velocity being essentially the same. It might be a product of getting punished in the bandboxes of the American League East, particularly his current home stadium. He does seem like a classic change of scenery type of candidate — bring him back to the AL West and pitching in parks and against teams he’s familiar with from his successful time with the A’s. Gray is third-year arbitration eligible for 2019, meaning you would get him for this year and next, which is something Dipoto craves. While the Yankees were willing to trade middle reliever Adam Warren to a team they might be facing in the American League Wild Card game, trading a starting pitcher that was once an All-Star and good enough for you to acquire the season before is a little different. Another name someone mentioned is right-hander Ervin Santana of the Twins, who missed much of the season with finger surgery. The Mariners also had interest in him in the past. And with Santana criticizing the front office to local writers, his exit from Minnesota could be expedited. But a $14 million option for 2019 is a bit of detractor. The Twins also have right-handers Jake Odorizzi and Kyle Gibson, who are under control for next season, and far less expensive. What do you think are the chances Kyle Lewis is starting in the OF to begin 2019? I don’t think that will happen for a variety of reasons. The Mariners aren’t going to rush Lewis to the big leagues. This current front office is vastly more patient, understanding the need for requisite time in the minor leagues. Because Lewis basically missed two seasons worth of games with knee issues, his development has been sidetracked. The Mariners know that advancing him too soon through the minor leagues would be counterproductive. He’s been solid since his promotion to Class AA Arkansas. But it’s not impossible to see him starting next season with the Travelers before moving up to Class AAA Tacoma at midseason of 2019. That could lead to a possible September call-up. The big key for Lewis is to finish up this season healthy, possibly play in the Arizona Fall League and then be ready to big league spring training in 2019. Getting to come in with the big league players and participate in camp with plenty of playing time in Cactus League games will be a way to gauge his progression. Now that the playoff race looks a little different with the Ms behind, would they consider moving Dee back to center and play Cano at 2B to make the lineup deeper? The addition of Cameron Maybin makes that seem unlikely. I haven’t seen Gordon doing any work in centerfield before games. Perhaps that changes when Cano returns. But there’s a reason why Cano is playing first base and third base on this rehab assignment, he’s going to play there some in games. Against a right-handed starting pitcher, their best lineup is to have him at first base instead of Ryon Healy. What will be interesting is what the Mariners do in 2019. Will they ask Gordon to return to centerfield or leave him at second base? How do you feel about the MiLB’s rule of automatically putting a player on at 2nd during extra innings? Do you think they should do this in the MLB? I think it’s perfectly fine for the minor leagues. I know the owners of the affiliates don’t want to hear it and Mariners director of player development Andy McKay will deliver a 20-minute rebuttal, but the purpose of minor league games is development not results. Sure, winning games and learning that mentality is beneficial. But it’s not as though kids aren’t exposed to the concept of winning before arriving in the minor leagues. And since it’s about development and not game results, there’s no need for minor league games to go beyond 12 innings. You are trying to control pitching usage and playing time for players. Those lengthy extra-inning games become counterproductive and injury risks. So if it speeds up the result, it’s a good thing. As much as I loathe covering extra-inning games and the deadline stress that it causes me, I don’t want to see it at the Major League level. It manufactures a situation instead of letting the outcome of the game remain organic. MLB commissioner Rob Manfred seems to obsess over pace of play while being overly progressive in trying implement change. Maybe he should spend some time addressing other problems like sub-par umpiring, minimal pay for minor league players and a domestic abuse policy that can suspend Robert Osuna for 75 games, but still allows him to play in the postseason. What's happening with Kuma? Will we ever see him again? Well, I see him most days in Seattle around 2 p.m. The veteran right-hander has still not given up the hope of getting his surgically-repaired right shoulder back to 100 percent, allowing him to pitch in a game again. But every time his rehab and recovery gets to the point where he can ratchet up the intensity to face hitters in a live batting practice situation, the shoulder doesn’t react well. Even after multiple setbacks this season, Iwakuma continues to play catch and long toss every day in an effort to build arm strength. But it’s almost impossible to see him being able to contribute to the Mariners this season. Even if he were to get healthy to start a rehab stint next week, there wouldn’t be enough time to get him built up enough to make a start in September. Realistically, Iwakuma is preparing for next season. Many pitchers would’ve given up by now, but Iwakuma’s discipline and dedication to his craft won’t allow him to do that until he exhausts every possibility. Where do you see Haniger in the next few years? He definitely has the ability of a star, but do you see him rising above and becoming something more? Do you see Dipoto signing him long term, also? (not sure what his contract is currently) Thanks! This is a subject I addressed in a previous mailbag. But for a bit of a refresher, Haniger is making just over $500,000 this season. That’s a pretty cheap price for an everyday outfielder that is giving you 2.9 WAR per Fangraphs. He’s under club control for 2019 and then starts arbitration eligibility in 2020. The Mariners probably aren’t in a rush to consider extending him until he gets past that first year of arbitration eligibility. Then you could look at buying out two arbitration years and the first few years of free agency. Haniger has been a brilliant acquisition for the Mariners. He plays extremely hard, he has a mature approach on the field and is obsessive about his daily preparation. He takes his profession and being good very seriously. And yet, he isn’t your typical young breakout player. He’ll turn 28 in December. So his free agency won’t hit until 2023. This is first full season at the MLB level, the Mariners would be wise see if he can sustain this success over the next two seasons before even considering an extension. I read somewhere that you aren’t a Mariners fan. If true, who’s your team? No judgment. I’ve been around longer the the Mariners have existed so my other team is KC. My Dad was a huge baseball fan & I grew up listening to games on the radio with him. Lots of good memories. You might have read it last week when I said I’m not a Mariners fan. But I’m also not a fan of any team other than the Montana Grizzlies and the Havre Blue Ponies. You give up being a fan when you get into this business. It may sound difficult, but after a while, it just becomes normal. Growing up in Montana, we had WGN and TBS as kids. That was the only baseball that we could really watch on television. My friends become Braves and Cubs fans because of it. But the first 12 MLB games that I saw in person were all in the Hubert H. Humphrey Dome in Minneapolis. Kirby Puckett was one of my favorite players of all time. But even then, I wasn’t really a Twins fan. I mostly just liked different players for a variety of reasons. They included Rickey Henderson, Chipper Jones, Mark Grace, Tony Gwynn and Mike Greenwell. Do you have any baseball uniform opinions? Favorites, non-favorites? (I am aware of UniWatch)? I used to be much more of a uniform nerd in the past. I prefer simplicity to gaudiness. I’m also a sucker for tradition. I think the Detroit Tigers, Boston Red Sox and Los Angeles Dodgers have the best home uniforms in baseball. They are clean, simple and unchanging. In terms of updated uniforms that try to look traditional, the Giants and Pirates home uniforms are outstanding. My favorite Mariners’ uniform is the Sunday off-white with royal blue and gold. I’m much more into the hats that teams wear. Most of the batting practice hats are heinous as are the spring training hats. The simpler the hat the better. The best professional baseball affiliated hat is the “R” hat from the Tacoma Rainiers. I assume that questionable calls by umpires get reviewed. What happens to umps who have a lot of bad calls? Players gets sent down. Do umps? Yes, Major League Baseball umpires get reviewed. Their strikezones are tracked and their calls are analyzed by supervisors. And yet, the quality of umpiring seems to be regressing with each season. Once an umpire progresses to a full time Major League status, he’s there till he wants to be or gets fired. There is no sending an umpire back down for a bad game. What’s more galling is that when umpires do make an incorrect call or were in the wrong for a situation, there’s little admittance to it by MLB or the umpire’s union. There have been major incidents where a mistake has been made by the umpiring crew and Major League Baseball will issue a statement or even suspend a crew for a series, but that’s very rare. Usually any sort of reprimand goes unannounced. Remember when the umpires all wore white wristbands to protest Ian Kinsler commenting on Angel Hernandez? The collective eyeball from people in and around baseball could have caused the earth to bounce off it’s orbit. As for what happens to umps who have a lot of bad calls? Well, they become Hernandez, C.B. Bucknor or Joe West. When robots eventually take over this planet and become our overlords, their impetus will be from having watched the umpiring in Major League Baseball. How close do you think the MLB is to implementing robotic umpires and actually wanting to do it? Even with the advanced technology and the interpretive strikezones of umpires these days, I don’t see it happening any time soon. The umpire’s union would never agree to it. There is also the problem of implementation. Sure you could do it in a big league ballpark, but what about in the minor leagues. Also if the system were to malfunction, then what happens to the game being played? Or you could look at it this way, Major League Baseball struggles to make instant replay normal and viable, how bad could is it going to mess up robot umpires. It could be “Maximum Overdrive” all over again.